What does test anxiety feel like and what can you do about it. Comments Off on What does test anxiety feel like and what can you do about it. Your heart is racing. your palms are sweaty. your stomach is doing flip flops. your confidence is gone. you can’t concentrate. you enter the exam room and you blow your big exam. you feel terrible. you took a prep course, but it didn’t help. your test anxiety has hurt your score again. the gmat’s, bar exams, med boards, med boards and sat’s can put too much pressure on you or on a student you love and care about. Good schools, big jobs and top salaries depend on these tests. Now, there are programs to help you conquer test anxiety. Conquertestanxiety.com. now your can stay calm, focused and confident when you take tests. go to conquertestanxiety.com. successful professionals use conquertestanxiety.com to stay calm, focused and confident. Conquertestanxiety.com can help you beat the competition, and get the top career you’ve dreamed about. Anxious about exams because you’ve been away from school for a while? conquertestanxiety.com can help. 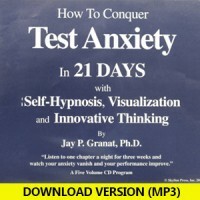 if you or someone you love has test anxiety go to conquertestanxiety. com. and conquer your test anxiety. If you mention the word test anxiety, most people can recall some experience with an exam or a series of tests which really got them nervous. Some years ago, I had to take a rather demanding licensure exam. Prior to entering the exam room, I noticed some students who were quite tense and who were trying to some last minute cramming at the exam site in order to get ready for the exam. Wisely,I got as far away from these people as possible and I found a quiet spot where I could place myself into what I call a cocoon of relaxation, confidence and focus. In addition, I was able to pass the exam the first time I took it. This was a big relief as I did not want to have to prepare for this test again. The pressure to perform well on tests is experienced by a wide range of people, students and professionals. Getting in to good colleges, prestigious graduate schools, top professional schools and obtaining licensure and earning a good living can, sometimes, be directly related to a person’s ability to get good scores on demanding exams. In today’s highly competitive world, the following kinds of standardized tests can create nervousness, anxiety, fear, and in some cases, panic in test takers: SAT, LSAT, PSAT, ACT, MCAT, Series 7 License Exam, Law Boards, Medical Boards, CPA Exam GMAT, Miller Analogy Test and GRE. Some people report symptoms of test anxiety when they have to pass a driving test, a driving test, a life guarding exam, an athletic test, a test to get a belt in the martial arts, a final exam, a quiz or a midterm exam. There are a number of things that can be done to lower test anxiety. Take enough practice exams to get familiar with the material and the structure of the exam questions. Be sure that your practice scores are allowing you to pass the exam or score where you need to score. If you are not scoring what you need to score, take a course or work with a tutor who knows the exam you are getting ready to take. It makes no sense to take an test if you are not scoring well in practice exams. Develop a routine prior to the exam which allows you to get mentally and physically ready. Pay attention to getting a good night’s sleep, the right nutrition and a pre-test routine which helps you to be calm, confident and focused. Never look at a test as a “life or death” situation. In most instances, you can retake an exam another time if you need to. Develop a curiosity about the exam and try to look upon it as a challenge. This may be hard for many anxious test takers, but this can be a useful mental state from which you can tackle exam questions. Some tests have time pressure. During practice exams, try to finish the test with time remaining. Doing this will help you to feel that you have extra time on test day. Use the same kinds of mental toughness, sport psychology and focusing techniques that top athletes use to perform well when they are under pressure. Get training in meditation, visualization, self-hypnosis and use these tools to get your mind into the right mental gear to perform well on your test. Read More about the author >> Jay P. Granat, Ph.D.